Copulas are used for correlating two or more random variables and allow for greater flexibility than older correlation methods, like rank_order_correlation. Associated with every Multivariate Copula is its copula density, which is much like the probability density of a (multivariate) distribution. 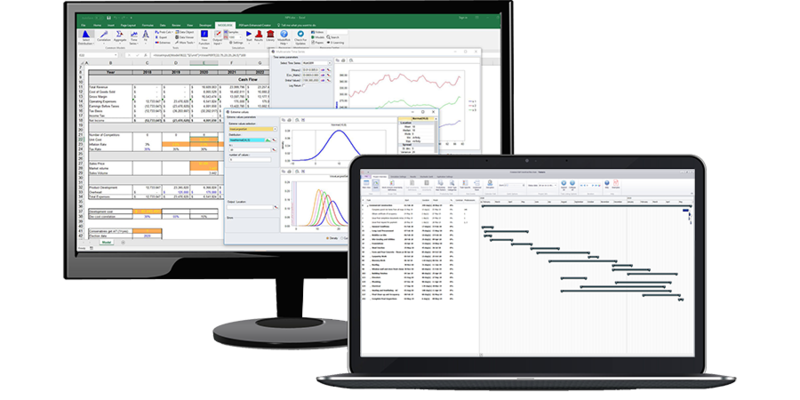 The output of a multivariate Copula in ModelRisk is an array of spreadsheet cells. These cells will contain Uniform(0,1) random variables with a pattern of correlation defined by the copula. These correlated Uniform(0,1) variables are used as the U-parameter in the desired distributions. The result is that the final spreadsheet cells will contain variables sampled from your chosen distributions and correlated (through the Uniform(0,1) variables as U-parameter) by the chosen copula. The Correlation matrix is shown, and dimensions can be added or removed by clicking the + and - buttons. When an element of the matrix is selected, a distribution to be correlated can be chosen for it. In the Correlated distributions area, the distributions to be correlated can be selected. These can be either typed directly, chosen from the Select Distribution window, or inserted from a spreadsheet cell. In the middle pane, a scatter plot of the copula is shown. Of course, a copula of dimension greater than 2 is hard to visualize. The points represent randomly generated (x,y) values generated by two distributions in the copula: the X- and the Y- axis represent the correlated variables associated with the first and second selected distribution, respectively. By default, the percentiles of these 2 correlated variables can be shown: these are values between 0 and 1. As explained above, certain pairs will have a higher probability of being generated, as determined by their correlation (i.e. the copula used). Optionally, the actual values of sampled random variables can be shown, with both axes rescaling appropriately. This goes one step further: the (x,y) pairs represent sampled random variables from the chosen distributions, with the percentiles now being driven by the copula. Internally, this is the U-parameter in action: it takes the random value generated by the copula. The zero-axes are shown with grey lines.